Share Your Opening Day Photos! Posted November 11th, 2017 by nocopf-admin & filed under News. We hope you are having a wonderful Opening Day 2017! Northern Colorado Pheasants Forever invites you to share your Opening Day photos with us! Either email them to us, or post them on our Facebook page! 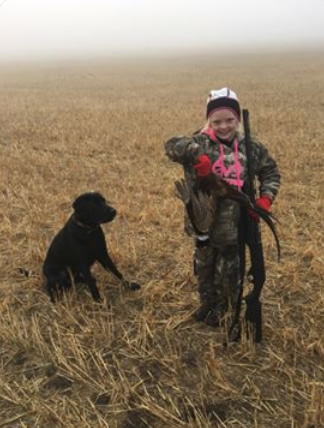 Here is 8-year old Haylee Jo Lambert showing off her pheasant on Opening Day in Logan County, with the help of her dog, Goose, who did a great job helping her find the birds! Tags: Colorado Pheasants Forever Northern Colorado Pheasants Forever Opening Day 2017 Share Your Opening Day Photos!